The last time Newsline climbed to the top of the highest worksite crane to take in the view it was a frigid December evening. Three months have passed and although the changes do not strike the eye, they are real. Three months have passed since Newsline climbed to the top of the highest worksite crane to take in the view of the construction worksite and although the changes do not strike the eye, they are real. Beginning this summer, the view will change dramatically. 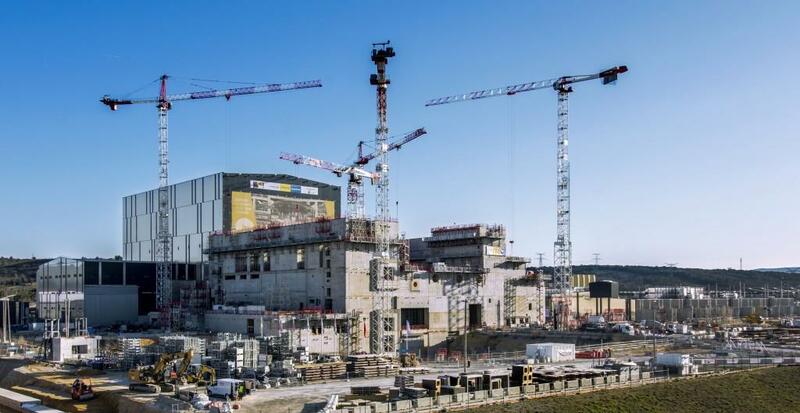 Pillars will rise, beams will be positioned at regular intervals and, for a while, the Tokamak Building and its trademark bioshield will be half-hidden by the steel lattice of the Crane Hall's walls and roof. 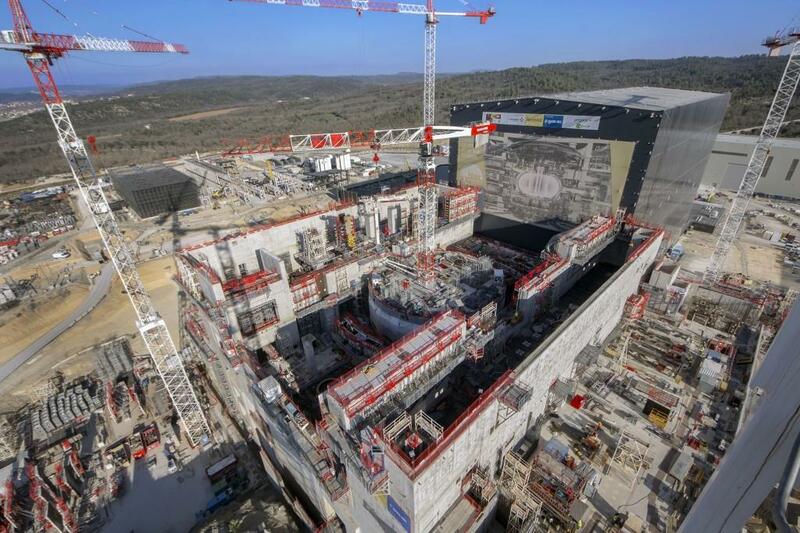 At a later stage, the extension will be clad in inox like the rest of the ITER buildings. 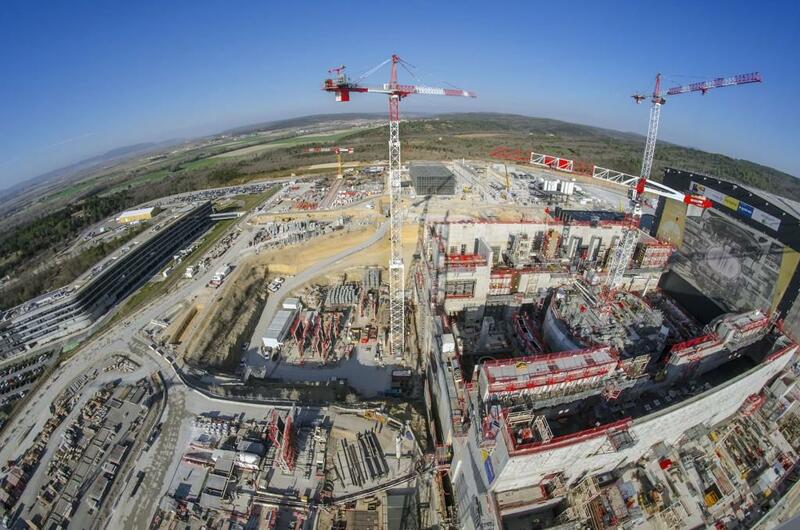 By then, the worksite will look like the "artist renditions" we used to publish when ITER had yet to become a reality. 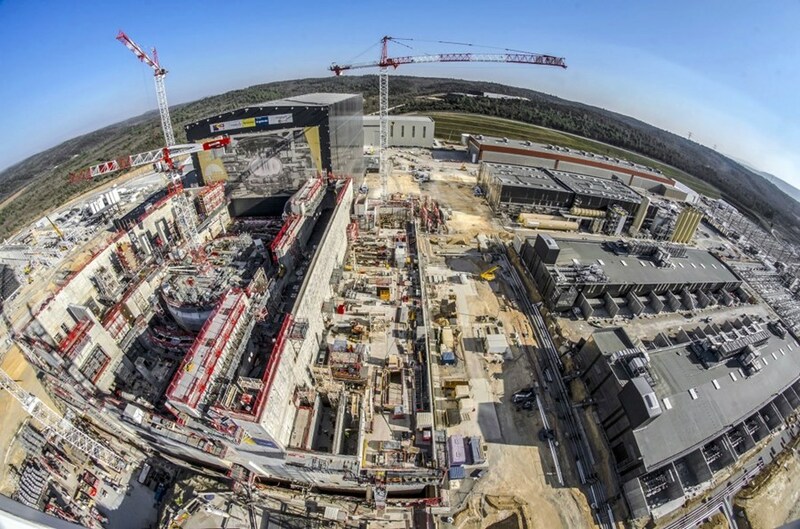 In addition to the progress visible by crane or rooftop, civil works are progressing strongly inside of the Tokamak Complex. All painting has been completed at B2 (lower basemat) level, sandblasting is underway in the Tokamak Pit to prepare for painting, contractors are installing doors and staircases, and the first cable trays have been introduced into the Diagnostic Building. Word of the Week: "corbel"
The ITER construction Word of the Week is "corbel." In classical architecture, a corbel is a structural piece of stone, metal or wood jutting from a wall to support a structure. In the foreground, the long rectangular Diagnostics Building will be covered over by a concrete slab. Just inside of the future slab, moving toward the bioshield, thick walls (corbels) have been poured to support the ten main columns of the Crane Hall. The opposite side will have a concrete slab also, poured on top of the columns visible in this photo. The columns of the steel structure will rest directly on that slab. 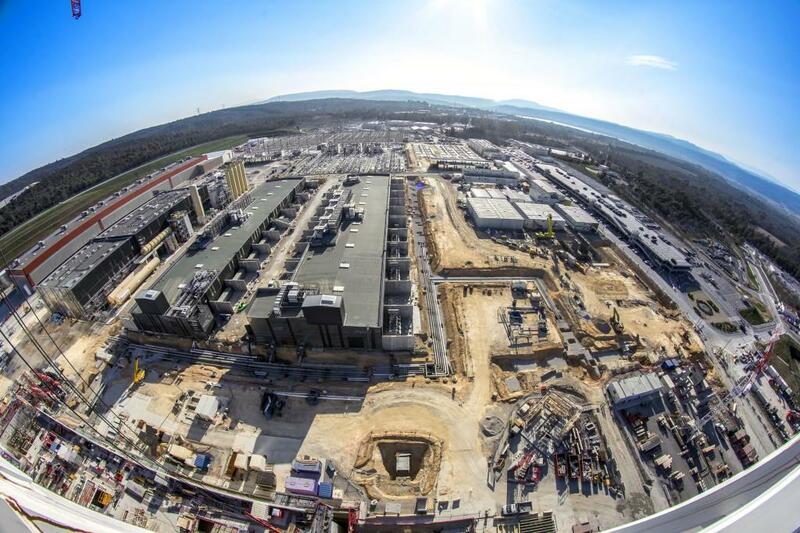 The twin buildings at the centre of the image will host equipment for converting the power to a form useable by the ITER magnets. Their construction is now complete, and they were handed over to the ITER Organization for equipment installation on 29 March (see article in this issue). The cabin-like structures on top of each building are "mezzanines"─future portals to the 50-metre-long bridges that will host the current-carrying busbars. Once the Crane Hall columns have been mounted (work starts this summer), the cladding of the vast workspace will advance quickly. Next year, there will be nothing to see from the crane and all photography will take place inside of the 175-metre-long crane bay connecting the Tokamak Building to the Assembly Hall.